Brief user guide and basic usage instructions on Project. A project is a collection of important information that helps users understand how something works in your Salesforce Organization. For example, how does your company use Salesforce to manage their associates sales pipeline? How do agents manage Cases to support your customers? Which components, objects, processes, and fields are used and why? To get started, head on over to the Catalio Application in your Salesforce Organization. Once there, ensure the current tab is “Projects”. To add a new project, click the new button in the upper right corner of the page. Who are the people that know more about the project? Stakeholders are key people who can provide more answers or involved in the creation of the solution. 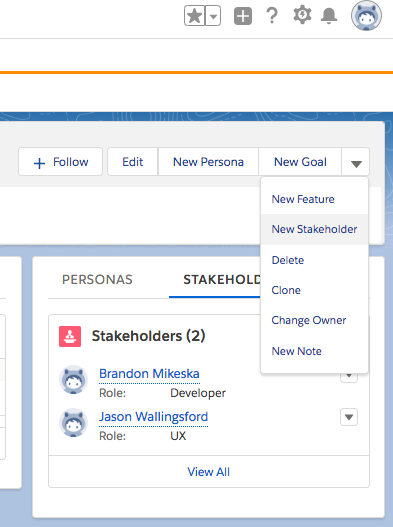 To add stakeholders, use the “New Stakeholder” at the top right of your project. Goals are important in all aspects of life. This includes your application. Layout your goals for each project so that your team will know exactly what the desired outcome of the application and features include. Clarifying your focus is never a bad thing. 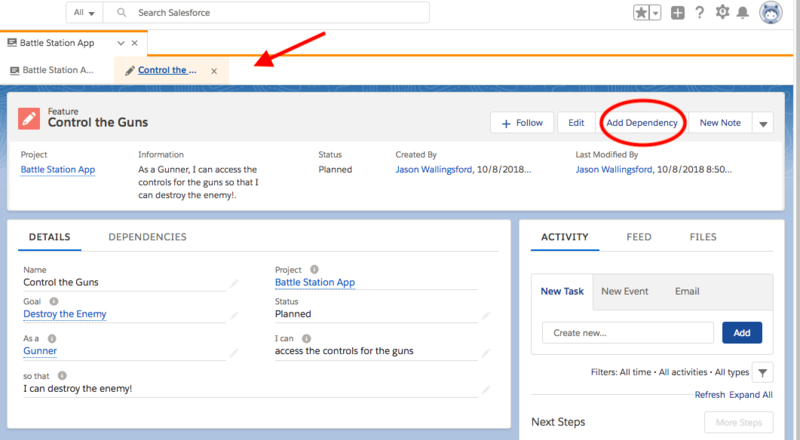 You are able to add goals to your project by clicking the, "New Goal" option in the top right of your page on a given project. What do you want your application to do? Outlining features and attaching them to goals helps everyone get on the same page and helps your application go from a dream to reality. It's much easier to reach your goals when you know how you're going to get there. To add a new feature to your project, click the drop down menu next to "New Goal." Select "New Feature" and begin adding specific features to your project. You are able to attach it to a particular goal and label it for your desired persona. A great way to think about components is imagining a bunch of Legos waiting to be used to build something awesome! Components are the pieces you use to build your project. 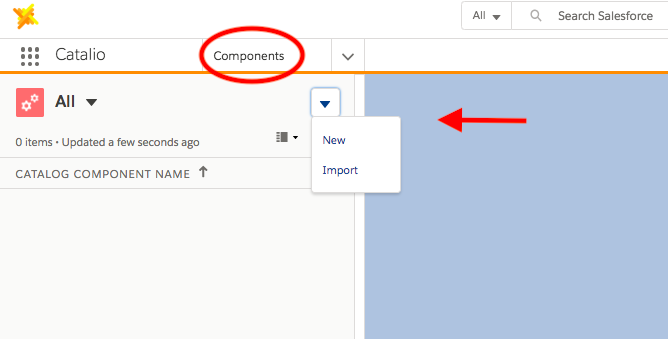 In order to add a new component, make sure you are on the "Components" tab. Then click, "New" in the upper right hand corner. You will be directed to a new page to add all of the component information. Dependencies are the things that give your features the direction they need to get the job done. They explain the how of your project. Dependencies are connected to features. You can add a dependency within a feature. Do this by clicking on a feature within a project (arrow). In the upper right hand corner, click ""Add Dependency." Select the component (building block) needed and add any specific implementation notes. Click "Save" and you have added your first dependency! If you need more help configuring your project, please reach out to us and we will be happy to help you!